In part one I discussed the huge opportunity available for guys right now on Tinder, and the first four of the big mistakes guys continue to make crushing their chances of success. So let’s move on to the final five deadly Tinder mistakes. The “I’ll go on a date with ANY cute girl” mindset isn’t helping you. You’re just stopping yourself from going on dates with the girls you REALLY want. Don’t swipe right unless you’re attracted to her! Be polarizing for the girls YOU want. Don’t be afraid to dress in a way that only a certain type of girl will find attractive. If your look or attitude appeals to your “type,” it’ll be MUCH easier to at attract those girls. You may be EXTREMELEY attracted to her. You may REALLY like her. But showing her how much is NOT in your best interest. Have a STRATEGY and stick to it. I’m NOT saying you should have a “copy-and-paste” routine…but you should know which direction to steer the conversation towards and STICK TO IT (don’t fall into the “she’s special” fallacy). If it worked on 10 cute girls, then it’ll also work on that drop-dead gorgeous smokeshow. It makes sense that following all on her social media channels will get her to notice you, right? WRONG. This tells her that you’re just like every other guy clamoring for her attention. Don’t follow her on Instagram, Facebook, Snapchat, or any other social media platform unless you’re dating her. If she friends or follows you, fine, but you should never be the one chasing her across social media. Unless there’s a good reason to break this rule, keep your messages short and to-the-point. One stupid remark can blow your chances for a date and anything you say can and will be used against you. When it comes to messaging, less is almost always more. 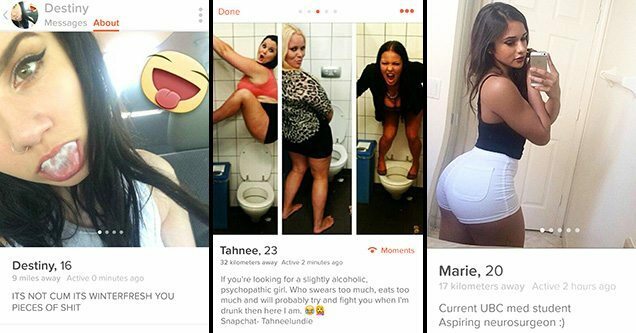 Albert Einstein defined insanity as, “Doing the same thing over again and again and expecting different results.” Well, Einstein would have been awesome on Tinder because would have been constantly tweaking and improving his profile and approach to Tinder. You, too, should look at Tinder with the mindset of a scientist. If your profile picture isn’t working, swap it out! If you’re not getting a lot of matches, don’t be afraid to seek out help. And that’s why we created an entire COURSE devoted to helping you get more matches on Tinder. The purpose of your secondary pictures is to tell her a story (i.e. you like to travel, play with puppies, etc). If all your pictures are from that awesome weekend out with your buddies, you’re only giving her a “sentence” from your story. Use pictures that show you having FUN in a variety of situations.